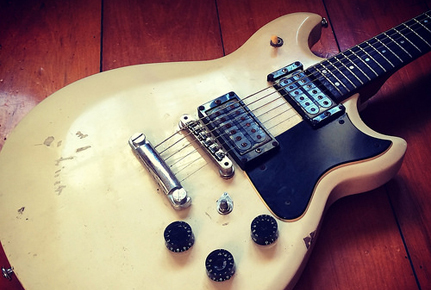 A guitar tough as nails, sorely neglected and due for a severe renovation. My main band is a band called Sixfthick (or 6fthick). I joined 10 years and a hell of a lot of gigs ago, but the band itself has been going on for nearly 20 years. In the 90′s, the guys drove up and down the east coast playing hundreds of shows… destroying pubs and stages in their wake. In the offtime, Geoff (one half of the Corbett singing brigade) would often look into the local hock shop to see what bargains were hanging there. 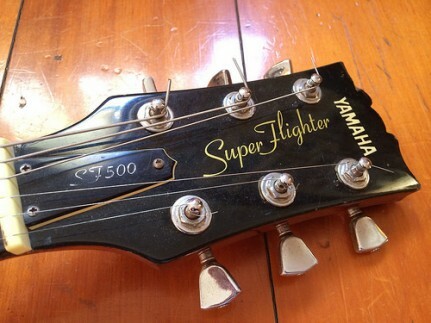 On one such occasion he found a relatively rare Yamaha Super Flighter SF500 for the princely sum of $180. Thinking it would make a good Sixfthick workhorse, he bought it and put it into service. Sixfthick’s guitarist at the time was a bit temperamental. A few gigs in, he threw the guitar across the stage and snapped the headstock. Geoff had the guitar repaired by local legend Tim from Tym Guitars and the Yamaha was tucked away for 10 years. About 5 years ago or so, Geoff handed the guitar over to our guitarist Dan to see if he’d want to play it. Dan tried it out and it was a bit too ‘rock’. Dan prefer’s Stratocasters, so the Super Flighter’s Les Paul-like ballsiness wasn’t really his thing. So it was tucked away for another 5 years. Fast forward to last weekend, and I asked Dan if I could grab and do up the poor Sixfthick Super Flighter. I personally love Les Paul’s/SG’s so I thought if the guitar was as good as I thought it would be, I’d definitely use it in my bands. Dan handed over the case and said ‘good luck’. I’d never owned a Yamaha guitar before. 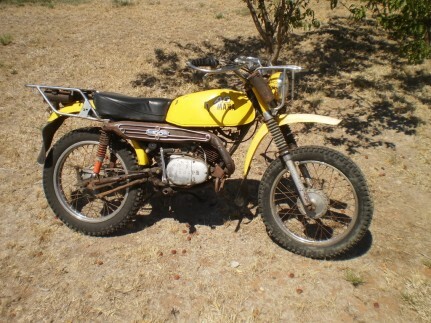 My only Yamaha experience was burning around the farm on my brother’s yellow Yamaha AG 100 motorbike. I think that’s where my love of the Yamaha crossed tuning forks logo came from. I kind of always thought it looked like a cool skull. I looked it over and was impressed with how damn solid this guitar was. It was very weighty and certainly felt Gibson-like. 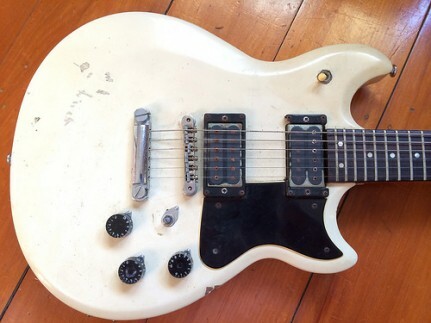 The body was kind of a cross between a Les Paul Standard, a Les Paul Junior Special and a SG. Plus a I loved the white colour with black guard. This was a stylish looking machine. What surprised me most was the neck. Being a bolt-on, I thought it’d be maple. 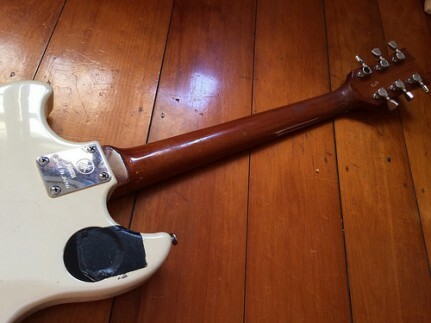 Nope… it was a very Gibson looking mahogany neck, complete with a 70′s style volute. It’s a very beefy profile. Yep, that’s a big chunk of tree. The rosewood board is what you’d call a ‘slab’. It’s about 5mm thick and load with 24 jumbo frets. I haven’t played a 24 fret guitar since 1994, so I’m not quite sure what to do up there. 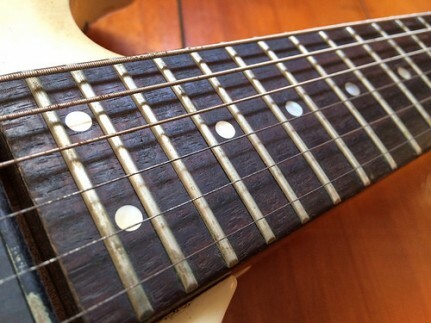 As you can see, the frets need a fair bit of spit and polish to get back to playing condition. Like the SG3 I posted about a few weeks ago, the hardware on this guitar is all top notch. Even though this is the base model Super Flighter, there isn’t really anything cheap about this guitar. 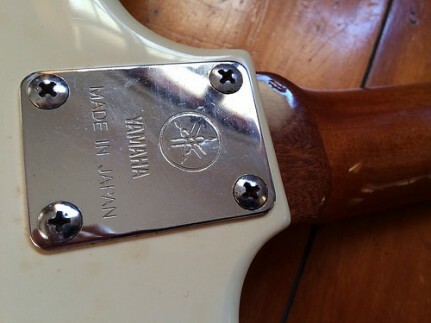 The tuners are Yamaha’s own and work very well. One of the covers has dropped off, but it’s still doing what it’s supposed to do. 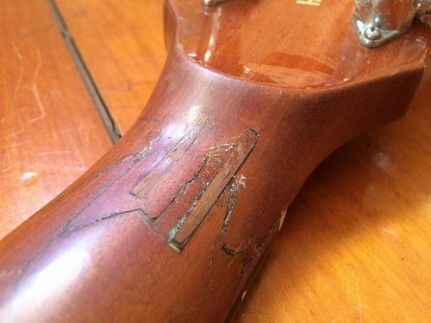 And being a 6fthick guitar, it’s got it’s little ’6FH’ tattoo. 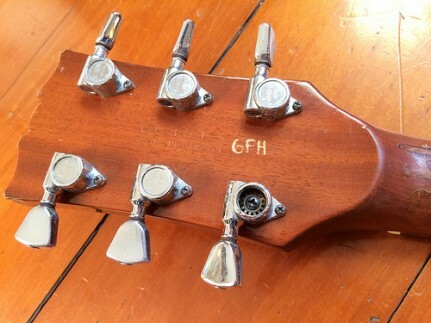 The headstock is really classy looking. 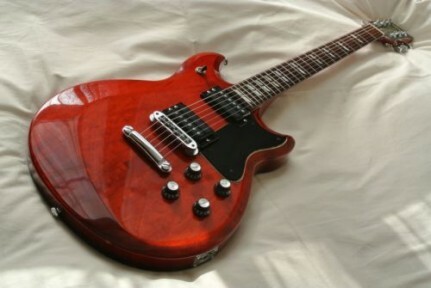 I love the Yamaha’s from this era… the SG2000′s and the like were up there with what Gibson was pumping out at the time. These guitars are starting to get the respect they deserve as people realise what fantastic value for money they are. The body itself is fairly wide. It’s a little bigger and thicker than an SG and the whole guitar feels very solid when strapped on. The carves help with the comfort a bit, too. All in all… a really comfortable feeling guitar. 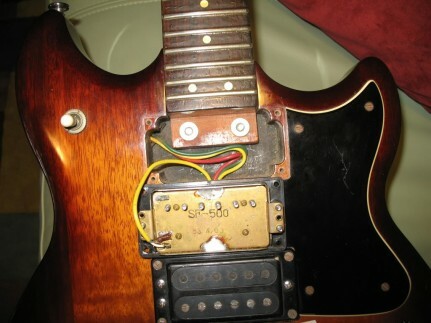 The plans for this beast are to clean it up and replace the pickups. Dan mentioned that these are pretty microphonic and from what I’ve read online, the SF500 had some pretty cheap pickups installed. 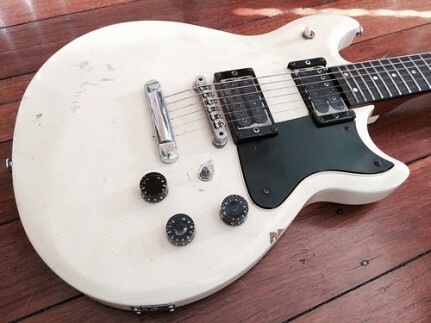 I’ve got a Gibson Historic ’57 humbucker that will go nicely in the bridge, plus a humbucker sized P90 in the neck. That’ll do nicely thanks. The higher end Super Flighters are certainly a stylish machine. This beauty is on ebay for $800 US. Set neck, cherry finish. What a babe. 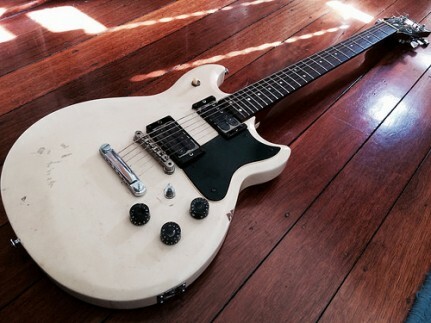 I’m really keen to get this guitar into action again. Apart from looking cool and being bullet proof, I’ll be able to play it at dodgy gigs where I don’t want to bring my Gibson. Which is most of them. To finish off, here’s a vid of someone playing the much more stylish SF1000. ***update. So the Yamaha is back in action. 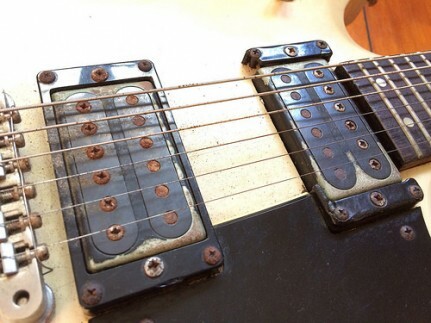 The new pickups work a treat… it’s a real smooth sounding rock machine and they compliment each other perfectly. 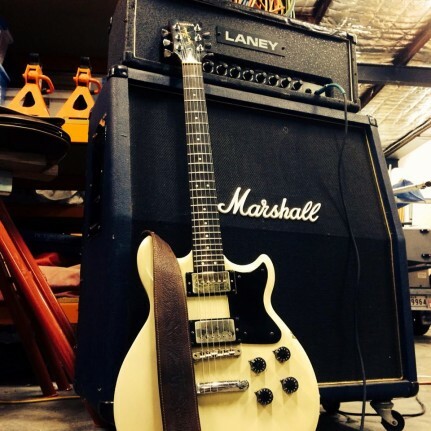 I had this guitar and my trusty SG at band practice and the SG stayed in it’s case the whole night. This guitar is a certified Gibson Killer. 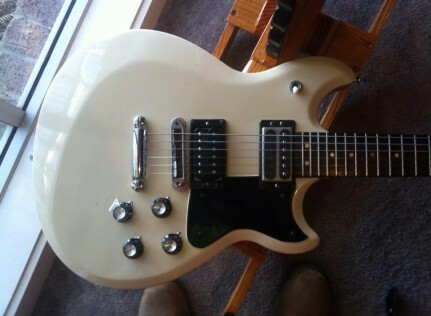 Also cool is this photo that guitarnerd facebook member Shaun posted of his own white Yamaha Super Flighter. A lot nicer looking than mine, Shaun! I’m stoked to finally join the Yamaha club.